← Orange & White Balls Hover in Sky. Photos Taken. White Lights Sometimes Blinking & Moving in Circles Seen in Sky. 1ST OF SEVERAL PHOTOS OF WHITE WHITES. CONTRAST HAS BEEN ENHANCED. Description: At approximately 9:30 PM on July 9, 2016 I went out into our backyard and looked up at the sky towards the Columbia River. I saw 2 to 5 various shaped white (not real bright) lights. They would move erratically. Some would move to the right, some to the left, one to the right, 4 to the left, sometimes blinking and sometimes going in circles. I watched them for approximately 30 minutes. My husband decided to get out his very bright LED flashlight to see if he could recreate what we were seeing. It didn’t work, you could not see our light that high up into the sky. But within a minute or less of him shining his light, they came together, stopped and then vanished. We waited and watched the skies for about another 20 to 30 minutes, but we never saw them again. They made no noise at all. I am just wondering if anyone else witnessed this strange phenomena? 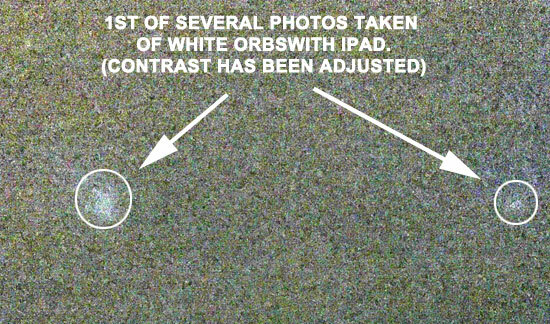 Note: The objects did not show up well on the Ipad photos. However, through enhanced contrast some lights do show up. It is difficult to ascertain the source of the lights. The witnesses feel that the lights may have exhibited intelligent behavior. This entry was posted in Intelligent behavior, Orb-like craft, Orb(s) of Light, Photos, silent, Strange Shaped, UFO Sightings 2016, UFO Sightings Washington and tagged Blinking, Circular movement, Erratic moving, White lights. Bookmark the permalink. 2 Responses to White Lights Sometimes Blinking & Moving in Circles Seen in Sky. IS THIS THE SAME DAY AND TIME OF THE SPACE STATION UFO SIGHTING ON JULY 9? – VIDEO FROM SPACE STATION. I haven’t been able to find the time of the Space Video on Jul 9, 2016. I doubt if the NASA video is related to the above sighting.